1979 1000HP Kenworth Truck! The Jake Brake Sounds Utterly Satisfying! - Muscle Cars Zone! 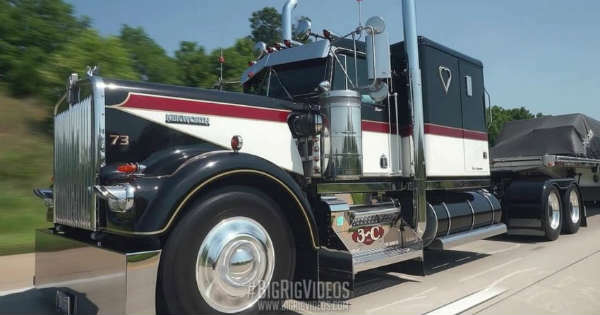 1979 1000HP Kenworth Truck! The Jake Brake Sounds Utterly Satisfying! New concepts have been introduced in the vehicle manufacturing all the time. Improved and safer systems are what every car factory is striving for. These past several years this trend is highly noticeable. What you are about to see in the following video is exactly that. The brand-new Jake Break system sounds truly mesmerizing. To put it simple, for those of you who do not know what this means, the Jake Brake is mostly installed on diesel engines and functions as an engine braking mechanism. After the compression cycle, the exhaust valves in the cylinders are opened thus releasing the compressed air which enables the vehicle to slow down. This is put to the test by the huge truck which has 1000 HP. This 1979 Kenworth twin stick looks exceptionally beautiful on the outside as well as on the inside. Once the Jake Brake system is activated, it creates a sound which is so satisfying to listen to. As the driver says, the truck was tested on the dyno and it goes at around 127 MPH, but he has never pushed it to the limit on the road. What do you think, do you enjoy and feel satisfied by the sound it creates? Want to search the market for Jake Brakes? Try this link!